Many thanks for all of your support for our daughter in her college application process. Your professional/personal assistance and guidance helped her go to her dream college - UCLA! Thank you. I know Ferah Aziz both from HECA, the professional association to which we both belong, and from personal interactions. I have extensive admissions experience (having worked both as the head of several admission offices, and working now as a college admission counselor) and can attest that she is an outstanding college admissions consultant. Ferah cares deeply about the welfare of each student with whom she works. She is also exceptionally well-informed and meticulous in her work. In addition, she is a kind and sane person with whom it is a pleasure to collaborate. I am confident that she serves her student clients and their families exceptionally well! Thank you Ferah! We appreciate all your help with our daughter. You are an amazing person and your passion to get her (and others) on "the right path" is commendable! Ferah has been instrumental in helping our daughter achieve the often stressful process of applying for college. She has spent time helping our daughter research schools that have the degree she is seeking, giving her multiple resources, and providing guidance on writing essays. Now that our daughter has chosen the college she would like to attend, Ferah continues to helpelp her find scholarship opportunities. I am grateful to the dedication and professionalism Ferah has provided through this entire process. Ferah is a wonderful instructor and an incredibly gifted motivator. The students we serve at IBMC are encouraged, inspired and pushed forward in her classes. No matter what subject Ferah teaches she gives her best to her students. Her preparation and delivery in the classroom is impeccable. I just wanted to say thank you very much for helping my daughter. Good work! My coach helped me with my job search process after I graduated from with my undergrad, and made that stressful time easier. She prepared me for interviews with mock interviews via Skype: I cannot tell you how helpful that was for my confidence. I also got great advice on my resume and cover letters, and I got the job i wanted. I later decided to pursue a graduate degree and apply for fellowships--a daunting and stressful task, as it required hours of diligent investigation and writing skills. So I reached out to my coach again. She helped me stay focused and to approach these problems with a step-by-step approach. I was accepted at my top choice school (USC) and received merit money as well. My coach gave me professional, caring and compassionate guidance. She has helped me be successful, and I feel others will be as lucky to have a launchphase2 coach as I was. My career coach helped me walk into all of my interviews feeling prepared and confident. With her help, I was offered a dream job in finance. My coach went above and beyond to ensure my success. I highly recommend launchphase2 to anyone looking to land their dream job. Ferah provided timely guidance, help and enlightenment to our daughter through the college application process. It certainly has been a great learning experience with some great results. We will be ever grateful to Ferah, as this could have been a very difficult journey; the gentle reminders and guidance were a blessing. At the beginning of summer in 2014 I had my first meeting with Ferah. Based on my increased heart rate, sweaty palms, and twitching eye, I think a may have had a little panic attack. All I could think as I sat there between my parents was my future and everything that this lady wanted me to do to prep for it. Questionnaires, personality tests, multiple worksheets about what I like in a college and what I don’t, and not to mention all the essays and drafts of a resume she wanted me to complete during the summer. The list seemed endless and I had just got off of my toughest year of high school and was ready to do some major relaxing, but that is not what Ferah nor my parents had in mind. My second meeting with Ferah was a lot less stressful and she really took the time to get to know my personality and me. Now that I look back on all those questions I answered to find out what college best fit my personality, I realize it wasn’t a waste of time because I would have never known that I wanted to go to a smaller school rather than a large university, or wanted a discussion oriented classroom, or to be close to a big city for internship opportunities. The more and more I went to see Ferah the more and more I got excited. Not only excited about my future and where I would be next year, but excited to just talk about my life to someone who truly cares and should get an award for being the best listener. A couple of my friends also go to Ferah and we have a little inside joke that not only is she our college prep coach, but like a therapist as well. She will listen to you if you are stressed, excited, sad, happy, or angry and will try and figure out her role in helping make things better or celebrating alongside with you. I cannot count the amount of hours I have spent contacting admissions counselors, researching/visiting schools, following suggested tips, and filling out applications, but I am thankful that I had Ferah and my parents pushing and supporting me each step of the way. Without the guidance of Ferah I would have never gotten into my top schools and received scholarships from them. I don’t know where I would be today in my college process without Ferah. As a student who went through launchphase2, I can confidently say that I know my college decision will provide me with a bright and successful future. Ferah has been instrumental in helping our daughter achieve the often stressful process of applying for college. She has spent time helping our daughter research schools that have the degree she is seeking, giving her multiple resources, and providing guidance on writing essays. Now that our daughter has chosen the college she would like to attend, Ferah continues to help her find scholarship opportunities. I am grateful to the dedication and professionalism Ferah has provided through this entire process. As the parent of a high school senior that just was accepted to and received merit scholarships from all the private and public schools to which she applied, I highly recommend Ferah and her team. Ferah made a difference by explaining what my daughter needed to do each year (college tests, community service, leadership, school work, essays and applications, college emails and visits and independent study abroad), helped her prioritize her efforts and provided timely follow-up, especially critical for the college essays. Collectively, this reduced our family's "college stress" to a manageable level and kept my daughter focused and in charge of the college process. She even told her school counselor that she "felt good about the college application process and was pretty sure she would get into her top schools." Ferah's deep understanding of the entire process has informed my parenting of both my children, one gifted and the other, a high achieving high school student with learning differences. When I learned that I had received an invitation to interview at several Physician Assistant programs, I was elated. Soon after though, the nerves set in as I realized what all goes into mastering the interview. That's where launchphase2 came in. The difference just two sessions with my career coach made was unbelievable. I felt much more confident in my answers and was able to adapt to anything the interviewers could throw at me. I ended up being accepted and I couldn't be happier. Thank you so much for your help, it played a crucial role in allowing me to take the next step towards my dream of becoming a PA! launchphase2 provided exceptional service - they came highly recommended and they didn’t disappoint! Our College Coach worked closely with us to develop an individualized test prep plan, especially with the limited time our son had available. She did a great job, and we were extremely pleased with the 4-point increase in our son’s ACT scores! My coach was by my side as I applied to eleven very different schools, and helped me through each application, multiple essays (including those for scholarships) and my personal statement….Thank you for all of your brainstorming and proof reading! In the end, I was accepted to ten of the eleven schools, the exception being a reach school. The acceptances came with more good news, as I also received thousands of dollars from multiple merit scholarships. The hard part was choosing which school to attend, because I liked After I chose to enroll in my dream school back East (with $26K in annual scholarships), my coach helped me make the decision to defer my admissions to take a gap year to volunteer in I am very happy that I had someone experienced and knowledgeable to help me through this tricky time. My coach helped me make many decisions, and helped me even more when I made the wrong choices on my own. I am very grateful to launchphase2! I currently attend CSU, a great university, but my freshman year was not what I hoped it would be. My college coach helped me narrow down colleges I would rather attend based on available majors, along with tuition costs and other important factors when looking at transferring schools. Together we were able to select a handful of intriguing places: she also helped me find a new college. Additionally, my coach helped me with job search tips, and I got a job in my field. Launchphase2 has been extremely helpful! The test prep I received from my coach was amazing! With the help of the test prep I was to practice the ACT and become comfortable with taking it, and I was able to reach my full potential. My score went from a 27 to a 31! The test prep also allowed me to hone my test taking skills so that I can utilize them on other standardized tests in my future. Ferah coached my son on how to approach college applications when he was a senior in high school. She had many suggestions about schools that might be a good fit, and helped him develop criteria to prioritize his choices. Ferah reviewed his essays and applications many times, giving feedback on content and organization. She was extremely helpful and my son benefited a great deal. Ferah was extraordinarily helpful throughout the entire college application and decision process. At the beginning of the application season, I didn’t really know what kind of college I wanted to attend. Ferah's guidance helped me craft a college list and put my best foot forward on all my applications, and I received almost half a million dollars in merit scholarship offers and 10 amazing acceptances. Now, reflecting on my college application journey, I am confident that my decision to attend UCLA in the fall was the best choice I could have made, and that is largely because Ferah was by my side from start to finish. launchphase2 has been an invaluable asset for me during my gap year. It was serendipity that my mother discovered them through a newspaper article. Luckier still was my opportunity to be educated in life skills and lessons: I learned how to write a resume & cover letter, prepare for a job interview through mock interviewing, what internships & jobs to apply for, and how to build connections. Without this timely help, I would be struggling in a quagmire of service learning quandaries, without any purpose to my days, and without any source of income. I definitely recommend launchphase2 to anyone in grades 8-10, high school, or college! Thank you so much for all the hard work and dedication that you have put into helping me find a college over the past year. I truly could not have done it without you and my family and I are so beyond appreciative. I'm so excited to start my new journey and can't wait to come back and share stories. 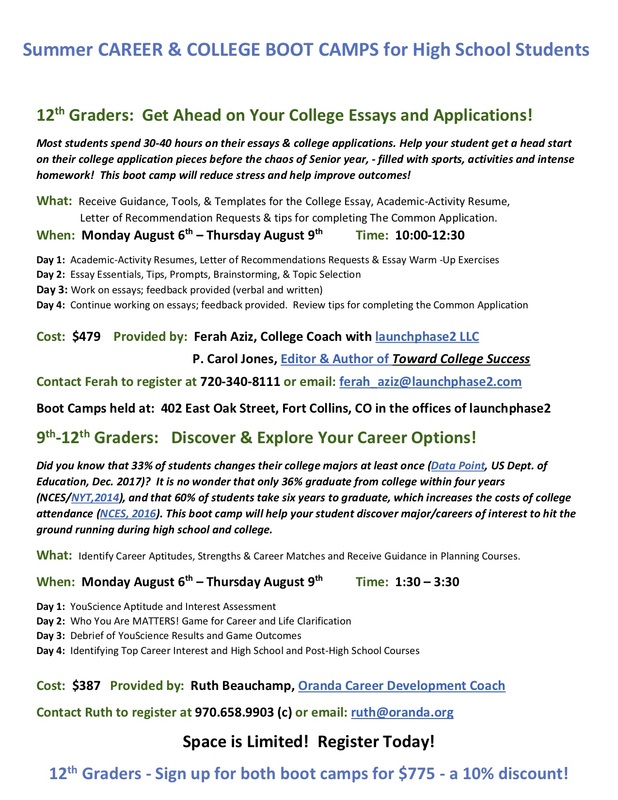 If you have a child that is approaching that time when college is in the near future I would highly recommend Ferah Aziz and launchphase 2 to get you on the right track and keep you there through the confusing process of decision making and choices leading up to a final decision on a college to attend. We struggled through the process on our own with our first child. For our second child we used launchphase2, what a difference it made. Ferah laid out a plan from start to finish for our daughter that included assignments to keep her on track. Ferah also helped to take much of the confusion out of deciding which schools were the best fit and the ones that should probably left off of the list. In the end our daughter chose a school that we know she will be happy with and one we can afford! Thank you Ferah for having the knowledge, skills and abilities to guide us to a decision we are all comfortable with! We hired Ferah to help our daughter navigate the intricacies of college admission. Her expertise in the subject matter was invaluable; from the do’s and the don’ts to managing all aspects of the college application process, our daughter was very well served. No stress, highly recommended! Ferah’s work on the college application process with our daughter was extremely helpful. Ferah helped her juggle and prioritize her current school work, preparing for ACT’s and applying to schools. It can feel overwhelming but Ferah’s guidance and organization helped a great deal. It reduced stress for us as well as keeping her on track. Ferah was excellent at keeping us in the loop with her thorough and timely weekly reports; it felt like a real partnership between all of us. Her knowledge of “good fit” schools, opened up some possibilities that we had not considered, resulting in multiple acceptances and scholarship offers that made expensive schools more accessible. Thank you Ferah, for your valuable help in this process! My only regret is I wish we had started with you sooner. "Ferah exceeded our expectations throughout the entire process. The essay brainstorming ideas were beneficial and resulted in quality finished work. Consulting through the application process including college specific essay questions helped us save time. Thanks to Farah's help, our daughter was accepted to every college she applied for and will be attending Loyola Marymount University. Launchphase2 was a great investment for our daughter and our family. Ms. Aziz is part college expert, part sociologist, and part therapist. She helped to guide my daughter through choosing, applying, and deciding on a college. She provided a thoughtful and compassionate sounding board, edited essays, and kept everyone on track. She was always available by email for questions and support. I would recommend Ms. Aziz to anyone who feels a little lost with the application process or is unsure how to navigate through this stressful endeavor. During the past year and a half, Ferah has served as a college coach for my son. She offers a comprehensive set of services that guided my son through many aspects of the college application process. What really stands out about Ferah is the rapport and trust that she built with my son that enabled her to be very effective in helping him identify possible career and major choices, college options, and a set of criteria for his decision. He is excited about the next four years, and very confident that his choice matches his interests, strengths, and type of college experience he desires. Thank you for everything you have done to help with the application process for our son's college future. Your time and energy along with your endless patience is greatly appreciated. Many, many thanks!!! Ferah was extremely helpful with my college search, college applications, and keeping me on top of my academics. She edited my essays multiple times and pushed me to write a more deeper and meaningful essay, which in turn helped me gain acceptances. She also offered support and many resources for ACT prep and scholarships. Ferah’s expertise and resources have greatly helped me! – Lauren C.
Launchphase2 has been such a helpful tool during my senior year. Not only was my coach able to help me determine the best fit colleges for me, but her help on college applications was indispensable. From brainstorming essay topics to editing essays, the help I received allowed me to stay composed during a very stressful time in my life. I would definitely recommend Launchphase2 to anyone; their service, expertise, and support are priceless. Going through the college application process can be overwhelming and stressful. It is easy to miss steps, easy to overlook opportunities, and easy to make mistakes. Using the coaching services of launchphase2 will help students stay on track, make deadlines, make critical decisions, and produce an outstanding application that college administrators will notice. Thank you for all your expert advice and help you have given my daughters over the years and continue to give them. It has been invaluable. Ferah has been a tremendous resource for our family. Professional insight and guidance in helping navigate the process of college admissions process. I highly recommend Ferah and her company!!! My college coach gave me excellent student success tips when I started college. I had a great college experience, graduated with a 4.0 GPA, and am now working in my dream career! I think launchphase2 is a wonderful program to help high school students in this way. Timely advice can make all the difference — it did for me. Thanks to an amazing daughter and Ferah Aziz of launchphase2, I am the proud mom of a UPenn student who will be joining the class of 2021. My daughter attended a high school with a weak college advising department. We started working with Ferah when my daughter was a rising 10th grader because we felt at sea about how to navigate the very complicated waters of college admissions. We got so much more from this decision than we were expecting. Ferah helped my daughter focus on what her goals were, what college environments would be the best for her, and the way to make herself a standout to those colleges. Ferah managed to keep her grounded in reality while also inspiring her to reach. One of the amazing things Ferah did was help my daughter begin to build a resume that popped…whether it was advising her on growing the charity my daughter had started in her early teens, to suggesting internships and summer programs, to setting up informational meetings so my daughter could find out about schools or careers from people directly associated with them, Ferah always went the extra mile in a very creative and effective fashion. Most importantly, she listened to my daughter and tailored her advice specifically to her as an individual. My daughter got into several reach schools (though not every single school she applied to), and a very broad array of schools that provided her with choices to make sure she could select a great fit. We strongly urge anyone facing the daunting process of college admissions to make use of the helping hand that Ferah offers. You will not regret it. Oh, and start much earlier than you think! Thank you so much for everything you have done for our daughter and her future. Your knowledge, skills, patience and dedication in assisting with the whole college processes are amazing. The journey of helping her to figure out where her passions lie and focusing on the schools where her major existed was so key to picking great schools to apply to. Encouraging her to apply to reach schools and not fearing rejections or uncertainty. All of the information and feedback was invaluable. You also gave her an unbelievable set of life lessons that will be with her throughout her life. Thank you for the many, many hours you have given to her future. I will be forever grateful for your generosity and spirit. Launchphase2 has helped my son and me navigate through the confusing world of grants, loans, scholarships, and financial aid. He is more confident now of applying to his choice of schools. It was awesome how quickly launchphase2’s college coach helped me choose my major and minor over Christmas break. I was able to change my college schedule for the second semester. This will save me time and money, and I’m really excited about my major and future plans! Thank you! If only we had known about launchphase2 earlier! My daughter struggled to figure out which university she wanted to attend, as well as what major she wanted to pursue. After a transfer, and obtaining a BS in a major she quickly found out she didn't enjoy, launchphase2 has helped her in so many ways. It’s been a long road, but she has settled on a career that she is very excited about. From seminars to interview coaching, launchphase2 provided professional advice, encouragement and confirmation. Thank you!